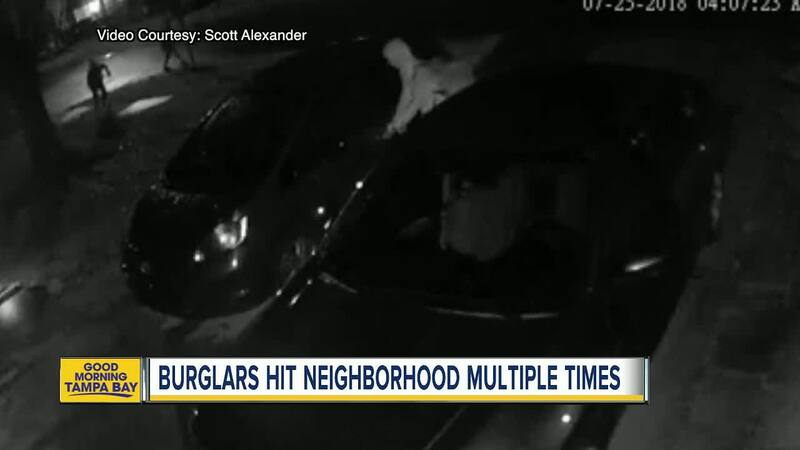 RIVERVIEW, Fla.— Burglars are repeatedly hitting cars and homes in one Riverview neighborhood, with five thefts in just three weeks. Two weeks ago three teens in hoodies were caught on camera at Jim Court in Riverview checking car doors. They ended up stealing two guns from unlocked cars. At four in the morning Wednesday, a nearby security camera caught what looks like three teens doing the same thing, testing car doors — not realizing a camera is watching their every move. “I think it’s a shame. You got people that work all day and pay for it but they go around stealing," said neighbor Tammy Alexander. It was her camera that caught them in action. But when car headlights approach, two of them start running. “They took off that way," pointed Alexander, "Left him hanging!" she laughed. Just a couple of houses down on Andy Drive is a new move-in, Lewis Clark. He tells ABC Action News on the same morning someone broke into his truck. But what they took left him scratching his head. “A bag of chips, a tobacco bowl and a lighter," said Clark. It seems laughable but detectives believe the same guys in the video are responsible for stealing the guns out of cars just half a mile away on Jim Court. “It’s just scary and I hope that it stops," said neighbor Heather Glynn. She says despite already having one camera, she’s going to install more. 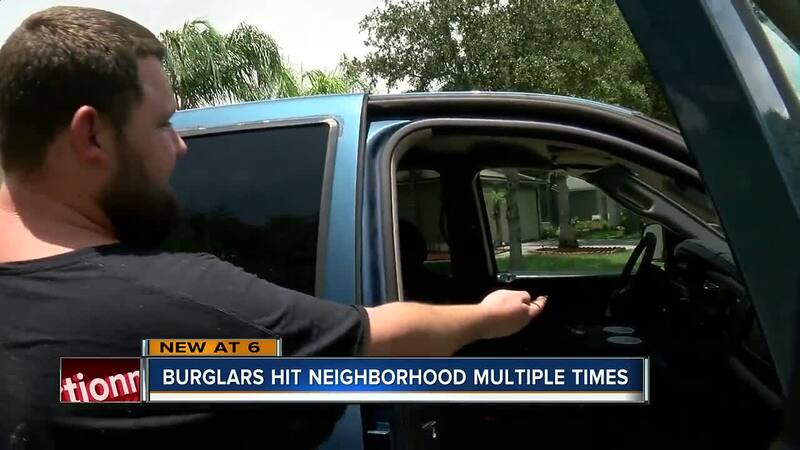 We checked crime stats and found in a one-mile radius this Riverview neighborhood has seen five burglaries in a matter of just three weeks — four of them targeting cars. “It's summertime, you should be out on the beach enjoying yourself hanging out before you go back to school but you are out running around at four in the morning taking people’s things. It’s ridiculous," said Clark. Clark and others are alerting neighbors about this break-in string on social media. Meanwhile, he’s making sure he keeps his car doors locked. A detective in charge of these break-in cases believes they have some good leads and are close to finding the guys responsible. However, if you recognize them, contact the Hillsborough County Sheriff’s Office or call Crime Stoppers at 1-800-873-TIPS (8477). For the stolen guns case, there's a reward of up to $3,000 for information that leads to the identification and arrest of the unknown suspects.